The Gilded Thimble believes that everything about your gown should be functional as well as beautiful. Bustles are the stunning way of making your gown safer and more manageable for your reception. Every bustle is convertible which means you can raise or lower it as needed. The Gilded Thimble is also committed to excellent, fair pricing, which means that most bustles are just $25 a piece! Below you will find a small sampling of the many bustle options. This is a single french bustle. It is a strong option that attaches underneath so that there are no hooks or attachments required on the outside of the dress. This is a triple french bustle. You'll notice that the longer, wider, or fuller the train is, there is a greater number of bustles that are required. This is a single french bustle. Wrist bustles are uncommon, but can be used for super-full, mermaid gowns. The bustle on the left is labeled, "Traditional Bustle". That bustle style is also called an "American" bustle. We just call them traditional bustles. 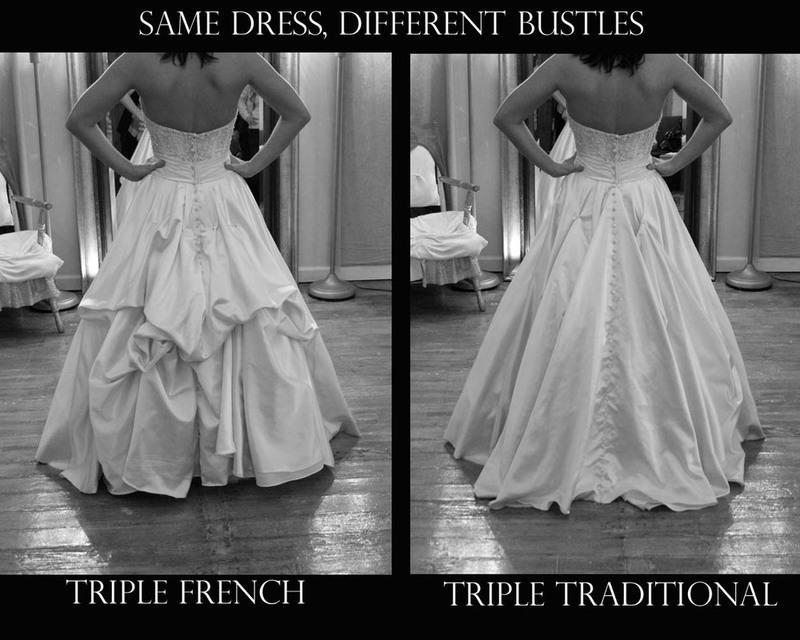 Traditional bustles are the most popular bustle style with our brides right now. They usually attach with tiny hooks and loops or buttons. Because of this, and the fact that they have to be non-obtrusive visually, they aren't quite as strong as the french bustles. That being said, we sew our bustles with upholstery thread, so they rarely break. You'll notice that some bustles get the train off of the ground completely, (full bustle). Others leave a little bit of the train on the floor, (demi bustle). You make this selection by thinking about how dance-able you want your dress to be. Also, if you are having an outdoor reception and you want to lessen the amount of staining and wear and tear your train receives, you may want a full bustle. For example in the picture above, both of the bustles are demi bustles. In the picture below, the French bustle is a full bustle, and the traditional bustle is a demi. The above bustles are pinned into place for the bride to decide which bustle she prefers. We usually pin your gown a couple different ways in order to offer you a choice. Same bustle, but viewed from two angles. This is a single traditional. This is a triple traditional bustle, holding up a very full train. This is a switch bustle. See how they cross over one another? This is a traditional triple bustle. This is one of my favorite bustles that we offer. Creative, one of a kind bustles like this draw brides from all over.